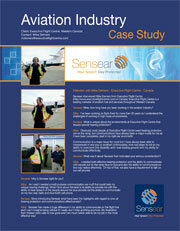 Download this case study, which includes an interview with Mike Demers from Executive Flight Centre, a leading marketer of aviation fuel and services throughout Western Canada. Learn how Sensear helped provide effective hearing protection with the ability to communicate on the ramp face-to-face. They also needed the ability to communicate on two-way radios and cell phones effectively. How did Sensear help solve all these challenges?